ItemA-03095 - The Crimean Huts at Esquimalt; built 1885; the hospital is on the left; Dr. Campbell's residence at right. ItemA-03097 - St. Paul's Church, Esquimalt; Macmunn No. 142. ItemA-03100 - St. Paul's Naval Chapel And Cemetery, Esquimalt. 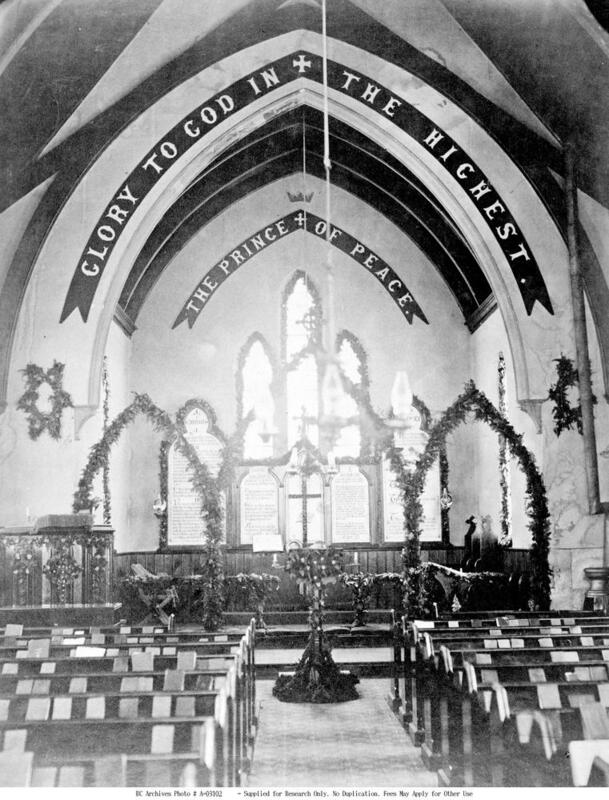 ItemA-03101 - Interior, St. Paul's Naval Chapel, Esquimalt. ItemA-03102 - Interior, St. Paul's Naval Church, Esquimalt. ItemA-03546 - Chimney Creek Bridge. ItemA-03464 - T. N. Hibben And Co., Books And Stationery, Victoria. ItemA-03465 - John Kurtz Cigar Manufactory on the floor above the M.W. Waite Stationers; Victoria. Item A-03102 - Interior, St. Paul's Naval Church, Esquimalt.